It's a bit weird, honestly, that in Series 1 of DCD's new Batman: The Animated Series action figures, three of them are based on the Season 4 redesigns, and the fourth is based on Seasons 1-3. Much like Transformers: Prime, BtAS was intended to cash in on the popularity of the live-action movies it followed. Gotham City was influenced by Tim Burton's version, the themesong was based on Danny Elfman's music, and Catwoman was blonde. Okay, that last one doesn't seem like much, but for 52 years she'd had black hair - or at least brown - but then Michelle Pfeiffer came along, and suddenly the cartoon character had light hair (a later episode revealed she'd been dyeing it, but stopped when she found out the company tested on animals). The show did make Selina Kyle a socialite rather than a social case, and she mainly targeted her fellow one-percenters, whom she considered idle and corrupt. She was also more of an animal rights activist rather than obsessively committing crimes based on lame "cat" puns - she still stole things, but "a rare catseye emerald from Egypt" wouldn't have any special appeal for her over "enough hundred-dollar bills to fill an Olympic-sized swimming pool." Catwoman's movie costume was inspired by the one David Mazzucchelli designed for Frank Miller's "Year One" story, just given a gritty makeover. Rather than trying to animate stitches and a corset, the animated series simplified things, bringing the costume more in line with its comic origins. She's wearing a smooth grey suit (the comics didn't switch to purple until 1993), with tall black gloves and black boots. She has a belt that is really just a series of golden discs, and tiny ears on her mask. The mask, by the way, has a large black section in the front - its it supposed to be that way, or are they just painting the shadows again? Actually, speaking of her head and the paint, we come to the first problem with this figure. She was sculpted by Irene Matar, who did a very nice job. But she sculpted her with the shape of eyes already on her head, and the paint doesn't line up right. It's too low, so her eyelashes end up painted under the lumps of flesh on her face, making her look squinty and weird. And then there's the articulation. Since the Batman review we've been warning you that we'd be talking about broken joints, and at last that time has come. Catwoman moves at the head, shoulders, elbows, wrists, hips, knees, boots, ankles and feet. The head is a balljoint, for expressive poses, and she has those H-hips that are supposed to take the place of balljoints. The ankles are a simple hinge, but then there's a rocker joint where the sole of the shoe is separate from the foot. And that would be fine, except that the swivel in her right elbow breaks. Like, 100% of the time. I don't know a single person who's bought Catwoman and not had her elbow break - and always in the exact same spot. Some people took advantage of DC's call for feedback, and still got broken ones in return. Some of them have broken in the package. The first one I got broke, so I exchanged it for a new one, and it broke too. I've resorted to gluing the arm on, and that was after carefully working with both heat and cold to free it up. Be careful. 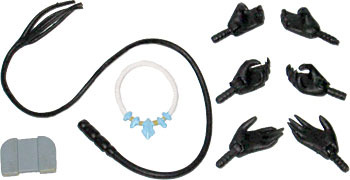 All Catwoman's accessories come from the two-parter that introduced her, "The Cat and the Claw." She has her whips, of course, and the necklace she was stealing when Batman first saw her. There's a little gray item in the tray that you might not recognize: it's a camera; she was using to take pictures of the contents of a safe. The figure also includes three sets of hands: two loosely gripping, two tightly gripping, and two relaxed. What, no slashing hands? The set also includes Catwoman's main kitty, Isis. She's 1½" tall and 2" long, and has six points of articulation: a balljointed head, and swivels for the shoulders, hips and tail. That's a surprising amount of movement! The legs have a tendency to pop out, but you can push them back in just fine. I'd rather have joints that come apart than ones that break off. Like Two-Face, Catwoman comes with a doll stand to help keep her upright - what works in a drawing doesn't always work in real life, and there's no way a Bruce Timm character would ever be able to stand on those itsy-bitsy little feet of theirs for very long. 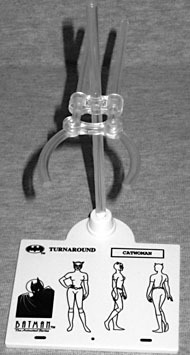 The base is still printed with the model sheet turnarounds of the character (thus allowing you to easily identify which base goes with which toy), and the clear plastic arm not only moves up and down on the post, the clamp is also designed to be positioned as far forward or back as you like. It's hard to find a spot around her torso where the clamp really holds firmly, though, especially since, by the time the arms are close enough together to keep her slender waist from slipping between them, they're very "front-to-back" while her body is "side-to-side," if that makes sense. 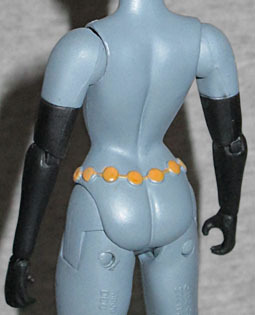 BtAS Catwoman has a great design, and the sculpt is excellent. But between the misaligned paint and the virtually guaranteed breakage, you might want to give this one a pass and wait for the figure based on her redesign to come out.